The NBA playoffs almost always reward resilience. Only in a few rare cases does a champion not have to deal with some degree of turbulence in the postseason. One example is the 1983 Philadelphia 76ers, who swept two series and won a third in five games after leading 3-0. The ’83 Sixers, however, represent the exception which proves the rule. For 98.2 percent of NBA champions, a walk over the hot coals of pressure becomes unavoidable. In light of this reality, the 2016 NBA Playoffs created a particularly searing surface for the Western Conference champion. 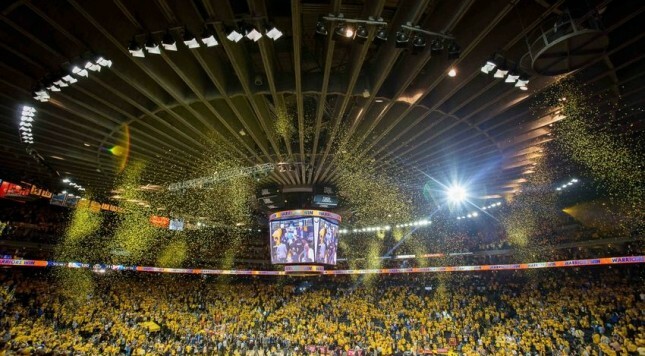 The Golden State Warriors captured that title Monday night in Oracle Arena, but that’s a secondary detail. Regardless of the winning team in Game 7, the best of the West was going to be a team which overcame multiple thumpings to reach the Finals for a date with the Cleveland Cavaliers. The Oklahoma City Thunder got crushed by the San Antonio Spurs in Game 1 of the West semifinals, and by the Warriors in Game 2 of the West Finals. Golden State got annihilated by Oklahoma City in Games 3 and 4 of the West Finals. All those games featured final margins of at least 24 points — they were all more decisive than the final margins ever could have suggested. These weren’t 13-point wins achieved with a relative degree of comfort, or 19-point wins that unraveled late in the third or early in the fourth quarter. These games were over midway through the third quarter. The force of such a beatdown doesn’t merely convey superiority, but total ownership. When great athletes — the best in their profession, skilled at levels most of their peers can’t match — suffer unholy drubbings, the blow to the ego can become considerable. Why are great athletes as great as they are? Unlike lesser professionals, they have shorter memories. Being imperfect, they will have bad nights at the office, but they don’t allow one bad night to bleed into two or three. What’s the old saying about miserable losses in sports? Don’t let them beat you twice. The 2016 NBA Playoffs have showcased this competitive virtue, tapping into one of the league’s previous ages of excellence. You might recall that after Game 1 of the Oklahoma City-San Antonio series, I wrote about the need for the Thunder to recall the example of Kareem Abdul-Jabbar in the 1985 NBA Finals. Kareem and the Los Angeles Lakers got crushed by 34 points in Game 1 against the Celtics. That game, and the weight of losing in the 1984 Finals, could have overwhelmed the Lakers. Kareem made sure to forget about that awful experience. In Game 2, he went for 30-17-8-3 (points-boards-assists-blocks). The Lakers won in Boston Garden and took the series in six games. Overcoming a massive blowout with clarity and conviction led the Pat Riley Lakers to their finest hour. One year earlier, the Celtics did the same thing in beating the Lakers. Everyone who recalls the 1984 NBA Finals remembers Gerald Henderson’s series-saving steal and basket late in Game 2. If Henderson had not made that play, the Celtics would not have won the series. However, what a lot of people forget from the ’84 Finals is that in Game 3, the Lakers brushed off that wrenching loss with a 137-104 boat-racing of the Celtics. Boston had to get past that humiliating Sunday afternoon and beat the surging Lakers on their home floor. Larry Bird hit this shot in the final 20 seconds to snap a 123-123 tie and give the Celtics the road win they needed in the series. The Celtics didn’t merely play that Game 4 with a different attitude. They intended to make sure the Lakers would not play with the same attitude as well. 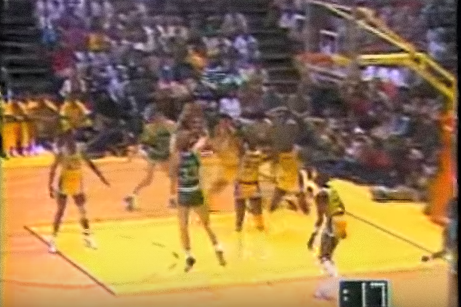 Boston’s Kevin McHale memorably clotheslined Laker forward Kurt Rambis in the open floor. In the NBA we know today, that play would have gotten McHale suspended for at least one game if not two. In the 1980s, it was little more than a hard playoff foul. The important thing to note is that it had the desired effect of angering the Lakers and getting them off their game. They became more focused on the Celtics and less aware of their own level of play. Demonstrating mental mastery of a hugely talented and formidable opponent on the road, just two days after suffering a 33-point loss, rates as one of the great in-series feats in NBA history. That’s why the Celtics and Lakers — both able to overcome huge blowouts in the 1984 and 1985 Finals — are remembered as such special champions. The 2016 West playoffs underscored how far the Oklahoma City Thunder progressed in the postseason… and how utterly resourceful the Golden State Warriors are. The essential point to take away from OKC’s blowout loss to the Spurs and the Warriors’ twin blowout losses to the Thunder in Games 3 and 4 of the West Finals is that when these slaughters had ended, it was hard to see how the losing team would successfully conquer its challenge. Oklahoma City, following Game 1 against the Spurs, had done nothing to prove it would soar to such heights in the next three weeks. The Warriors, given a chance by some after Game 3, certainly appeared to be in massive trouble after Game 4. The Dubs weren’t dead, but even the most optimistic fan could see that the climb out of trouble would be treacherous and hard to survive. The fact that OKC led by seven points with roughly five minutes left in Game 6 validates the idea that Golden State had a knife to its throat. Yet, the Warriors, following a second straight bloodbath in Game 4, managed to psychologically wipe their slate clean. People who haven’t been high-level athletes (I’m one of them) can’t fully understand just how tough it is to have your insides handed to you on a platter… and then compete the next night or the next game, especially in a must-win situations. In the alpha-dog world of cutthroat competition, it is only natural for fearsome displays of dominance to create a great deal of mental leverage. Being able to have a short memory in the face of a savage beatdown is a capacity all athletes need, but few have. The Thunder displayed this capacity against the Spurs. The Warriors have now demonstrated the same against the Thunder. The 1984 Boston Celtics and the 1985 Los Angeles Lakers can very deeply appreciate what the Thunder and the freshly-minted Western Conference champion Warriors have done this playoff season.